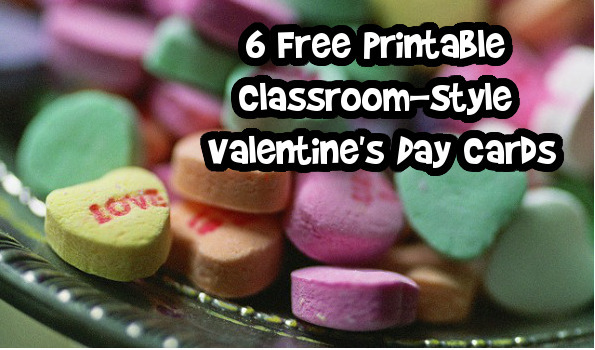 6 Free Printable Classroom-Style Valentine's Day Cards! Valentine’s Day is coming your way whether you are ready or not. If you have kids, that can mean buying many little treats for all of their friends. My default last minute idea is generally to head to the Dollar Store and fill some bags with cheap candy or treats. I could be more creative even at the last minute and so can you. All you need is a printer and a few inexpensive items that will cost you less than the goody bags you were going to buy anyways. Frozen is still super-hot these days. I have little doubt Frozen Valentines will be in many mailboxes and loved by many kids this year. I know my daughter wanted the Frozen Valentine’s for her class and your kid might too. Skip the boxed valentines and print some off at home for free instead. Disney Family has a nice selection of free Frozen Valentines that you can print off faster than Olaf melts in summer. I swear my daughter laughed at that Olaf joke and retold it a dozen times. Here are some fun cards for your favourite gamer. Check out these Minecraft Valentines from Cute As A Fox. Nine different designs are available such as “Diamonds are a Miners best friend” or “I’m no CREEPER, I just want to be your Valentine.” These cards are sure to be as popular with both gamer boys and girls. Check out No Biggie for a sweet little paper airplane Valentine. The Valentine proudly proclaims “You Make My Heart Soar.” All you need is a printer and some paper for this project. If you want to add a treat, No Biggie suggests something slim such as a stick of gum to tape into the plane. I would soar one of these over the cubicle wall to my coworker. The next Valentine is a fun treat without the candy. Check out these yummy “You’re awesome sauce” printable labels from Creating Really Awesome Free Things. Simply print, cut and tape to the tops of individually portioned applesauces. If you are feeling generous, you could cut them in rectangles and put them on the squeeze pouches of applesauces. Simple, delicious and you can make them while you catch up on your favourite tv show. I love these Valentine’s that include a small toy animal from Sweet C’s Designs. Print out these Valentine cards and tie a tiny plastic animal or animal eraser onto the Valentine for a fun treat. I would highly recommend tying the animals on with string instead of taping to ensure they stay put on your card. The Clumsy Crafter has a cute collection of printable Valentines. This free printable includes some cute standard valentines such as owls and cupcakes. Also included are a few valentines that are a little different such as a retro cassette, sewing machine and typewriter. You are sure to find a Valentine worth printing and slipping inside your sweetie’s coat pocket or your kiddo’s lunch. My husband might just find the “You are the cheese to my macaroni” Valentine inside his coat pocket. Bargainmoosers, which card is your favourite Valentine from the long list above?